I didn’t have a lot of time for handmade gifts this year with the full time job and all. Somehow I managed to make more than I thought I would. 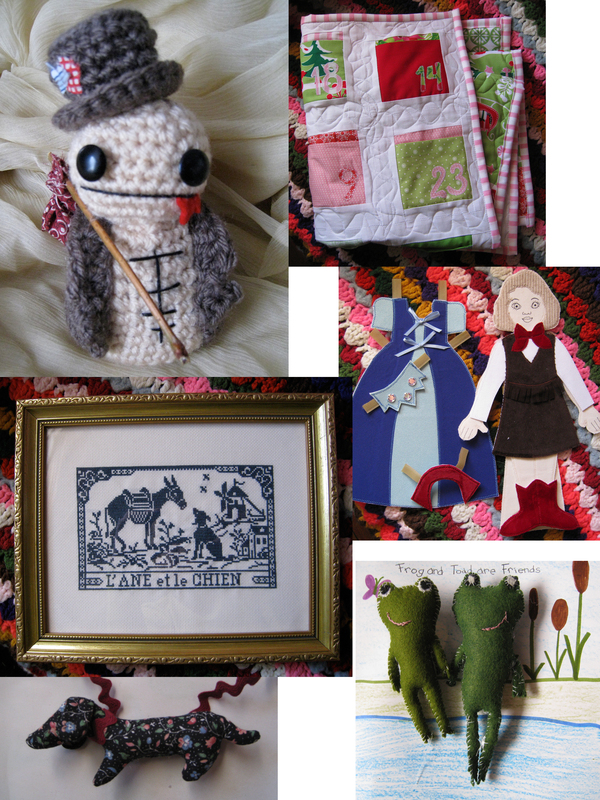 Here are a few of my favorite handmade gifts from Christmas this year. A zombie hobo for a friend with a fondness for hobos and possibly zombies. The pattern is loosely based on one from this wonderful little book. An Advent calendar quilt made from the tutorial found here; I actually made 2 of these bad boys. A fabric paper doll made from a McCalls pattern. Frog and Toad were made for me by my lovely daughter with no pattern and all her own! A Doxie necklace (and several pin versions) made from instructions on Etsy. And finally a major undertaking cross stitch made from a vintage French chart. Not bad for an insanely busy season!